We have all heard amazing stories of rare and expensive motorcycles found in barns around the world. However, this is the first time we’ve heard of a bike being found in a toilet. This is how the story goes… in the late 1940’s a gentleman by the name of Mr Bicker had heard tales that a Harley, still in a wooden crate, was sitting in a remote mine in Western Australia. After an extensive search his father located the bike and it turned out to be in the men’s room of the mine. Best of all, the machine was a factory racer with overhead valves. Essentially a twenty year old motorcycle at the time, it was not considered rare but still a desirable ride. The owner at the mines was not able to get the bike running so he decided to sell it. Removing the wheels, the motorcycle was carted home in the back of his father’s car. After he got it home, Bicker was able to get the Harley started easily, maybe running it for the first time since it was imported. 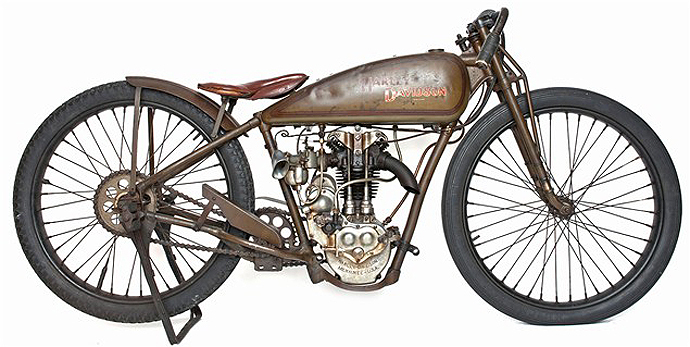 On January 6th 2011, this rare 1929 Harley-Davidson fetched $125,800 at the Bonhams Vegas auction – not bad for a ‘toilet find’. But this was not just any Harley. This Peashooter was in exceptional original condition, perhaps the best known in the world. With its known racing heritage, the bike is in remarkable shape and people have thought it looks like its been in a time capsule since it left the Milwaukee factory in 1929.